Have you made New Year’s resolutions in the past and come February 1st, they are discarded and forgotten? Maybe you know there’s a better way to research your family but you’re stuck in the same routine. Is your pile of paper getting deeper and deeper? 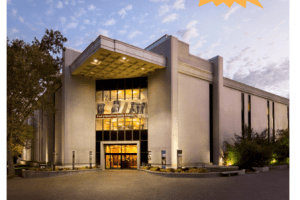 Don’t worry – I’ve been there and I’m going to give you some ideas on how you can start now to make some changes that will make a difference in your genealogy life. The key word here is reasonable. I regularly teach about organizing research and I hear stories of people with a room full of inherited genealogy. They are totally overwhelmed and don’t know how to start. Whatever your situation – whether it is dealing with boxes of family group sheets, a huge photo digitizing project, or a redo of your genealogy, be reasonable. How many hours in a day or week can you actually spend on your goal? I’ve been guilty of thinking I could do an hour of digitizing or organizing a day. When my day filled up with client work, podcasting, writing, conference presentations, etc. I’d give up on that goal. Reasonably, I can only do one hour a week on organizing or digitizing photos. If I set that as my goal and really do it, at the end of the year, I’ll have spent 52 hours on that project! Large goals need to be broken down into manageable pieces. My overarching goal for the year is to master a process for using DNA in my genealogy research. Many of my client projects have a DNA element, and I need to be using the best methods available to tackle them in the allotted time. Education and practice is huge with the DNA world changing daily, so I’m dedicating one afternoon a week to watch webinars, read articles and practice new techniques. I have created a schedule for my DNA work with specific tasks so I make progress and not get overwhelmed. Those tasks are simple such as watch a webinar on GEDmatch and learn to use a new tool. The biggest goal I’ve achieved in the last three years was completing the Accreditation process. I wasn’t 100% committed until I published it here on FamilyLocket. Writing the blog post publicly announcing my intention was scary but it was exactly what I needed. You don’t need to write a blog post – but the act of writing a goal is important. Be sure to put the goal somewhere visible. Write it out and put it on your wall. Set it to be your screensaver. Add it to your calendar as a daily reminder. Do what works for you. Personally, I’ve created a sticky note for each goal and pinned it to the top of my Google Keep board. I use Google Keep regularly to keep organized and I’ll see my goals often. 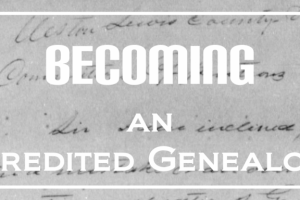 You probably already have in mind what you need to do to improve your genealogy research this year. But just in case you need some inspiration. Here are some of my favorite categories and suggestions as well as links to past blog posts and podcasts going more in depth. 1. Create a digital folder system for your digitized documents and photos and organize your computer files. 2. Figure out a naming protocol for your digitized documents and photos, then use it to rename digitized or downloaded images. 3. Create a storage system for the documents you’d like to keep as paper. Spend time regularly getting your paper piles under control. 1. Try using the Pomodoro technique. Set a timer for 25 minutes, then get up and move around for five minutes. Repeat for a total of 2 hours then take a 30 minute break. 2. Identify your time thieves and see if you can free up more family history time. 3. Stop chasing bright shiny objects and try out the Research Like a Pro method to research more productively. 1. Attend a conference, take a class, or pursue an online course in a genealogy topic that appeals to you. 2. Watch a webinar series on a challenging locality or record type in your research. 3. Discover and read a great book about one of your research challenges. How are you planning to improve your genealogy research in the coming year? Share one goal in the comments section and commit! Best of luck in your all your genealogical endeavors! I think you wrote this just for me. Im the gal with a room full of genealogy that I brought home from my dad’s in October. Most of it is in notebooks, over 100 of them. The pictures are stuffed in boxes. My goal this year is to sort it by 1) my childhood family) 2) my family 3) my dad’s research 4) my moms research and 5) my aunts research. This is my first goal. While I’m doing this large sort Im continuing to work through the ecourse. Im loving all the things I’m learning and can’t wait to start other projects. Good luck with those notebooks and pictures. What a great goal to sort it out this year, then you can tackle parts of it the next. Thanks for letting us know you’re enjoying the e Course! I hope 2019 is full of discoveries for you in your family history. Just what I needed as I’m trying to gain a focus for the New Year with all its demands. I will use google keep as my screensaver. A simple brilliant step to take as soon as I post my thanks. So many things I want to do, along with the need to do list! So I will be REASONABLE. I appreciate your very concrete examples of making those small steps forward! Happy New Year! Have fun making your list! Just think of the progress we can make if we just keep moving forward each year. I love how much I consistently learn from you. Thanks for this timely post! I am inspired and love learning from you! Thanks Cherry! I hope 2019 is a great year for your family history research. I love your podcasts and newsletters. Thank you for sharing the way you write out your goals and for sharing links to additional resources. One of my goals this year is to participate in your 14 Day Mini Research Like a Pro Challenge. An additional goal is to do 4 family history marathons this year (scheduling one Saturday per quarter) to work on my mountain of family history boxes. Could you please share what you like to use to do your time diary? I think this would be a good thing for me to do too. Thanks millions for all you do! Those are great goals! 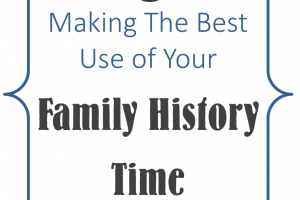 I love the idea of a family history marathon to really tackle big projects. For my time diary, I just carry around a small notebook and note what I’ve been doing every hour or so. It is really revealing!